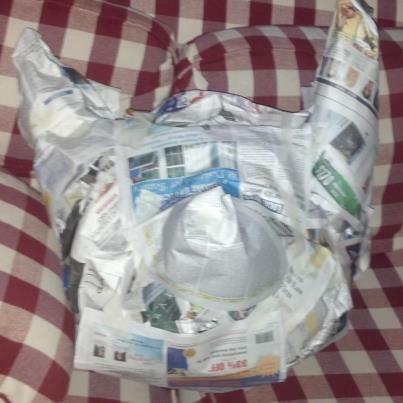 I started out with newspaper sculpted around a beach ball. 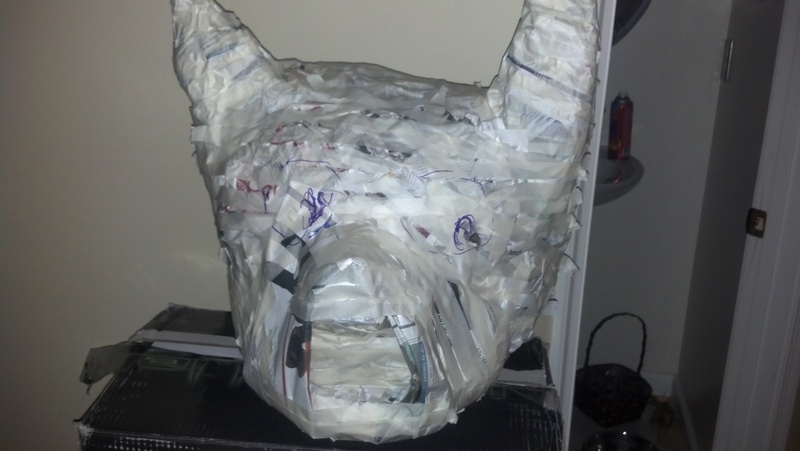 Before paper-mache-ing the newspaper, I decided to add an open mouth as part of the mask. 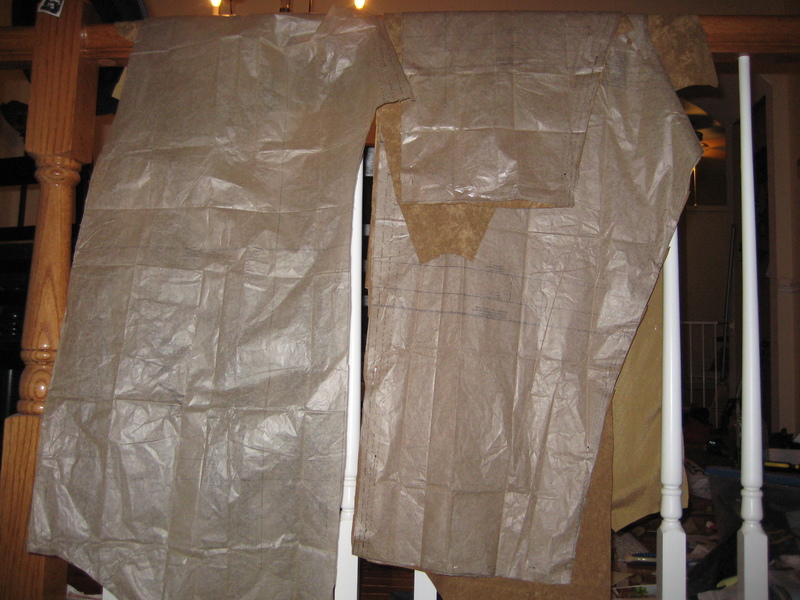 In the meantime, while the paper mache was drying, I found a pattern at the fabric store, which I modified to suit my purposes. 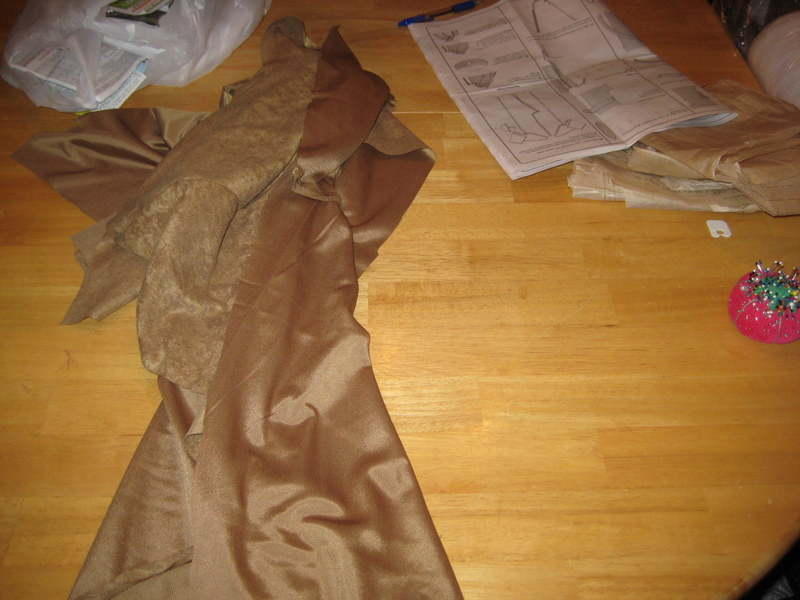 First step: cutting the pattern and the fabric. 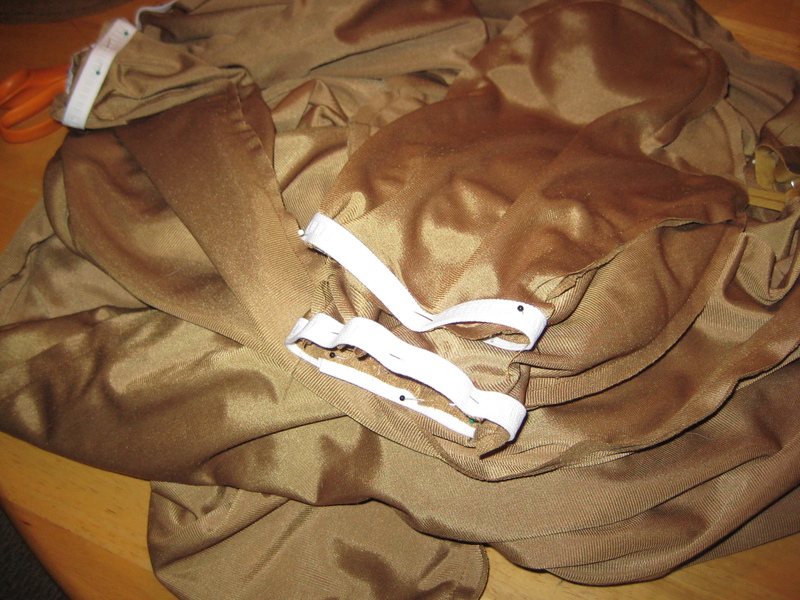 The cut fabric starts to come together, thanks to my sewing machine. Old but reliable. A real trooper! 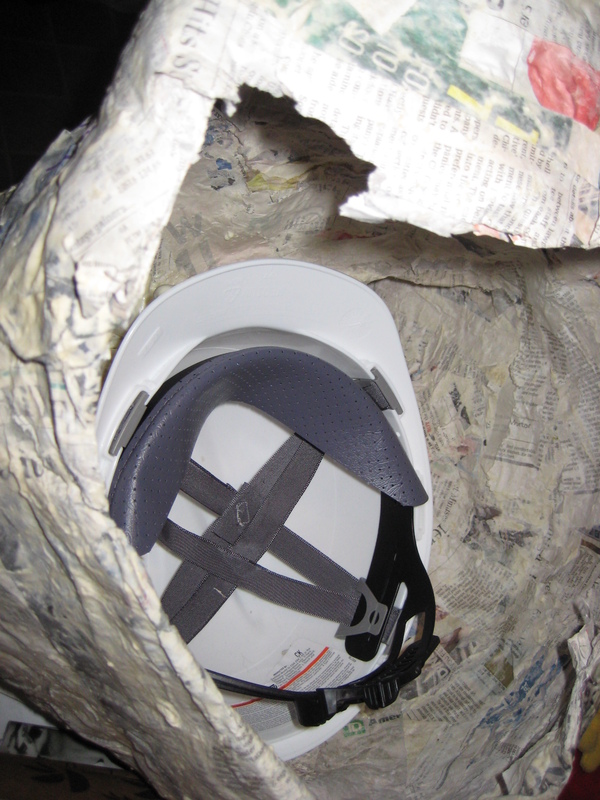 With the paper mache dry, I attached a lightweight construction helmet to the inside of the mask, insuring it would stay balanced and snug on the head of the victim–I mean, volunteer–who gets to wear the costume! 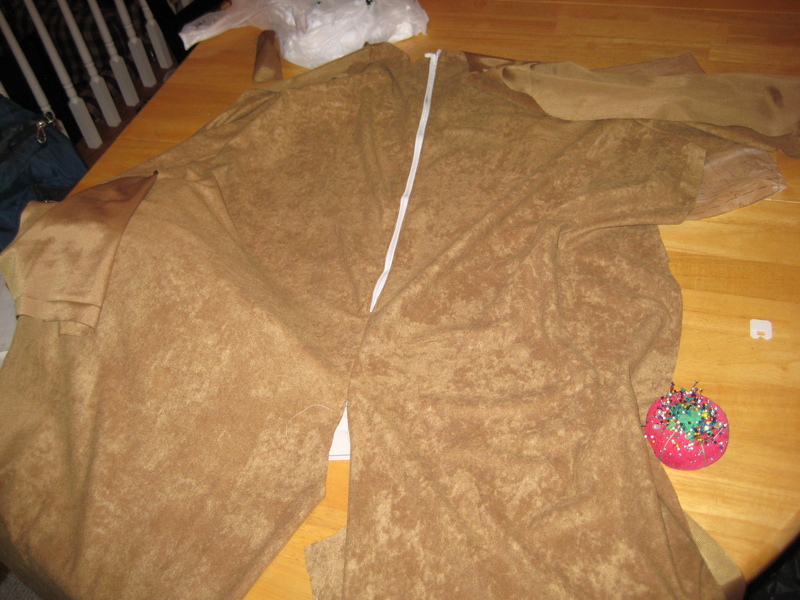 A zipper makes the suit come together! 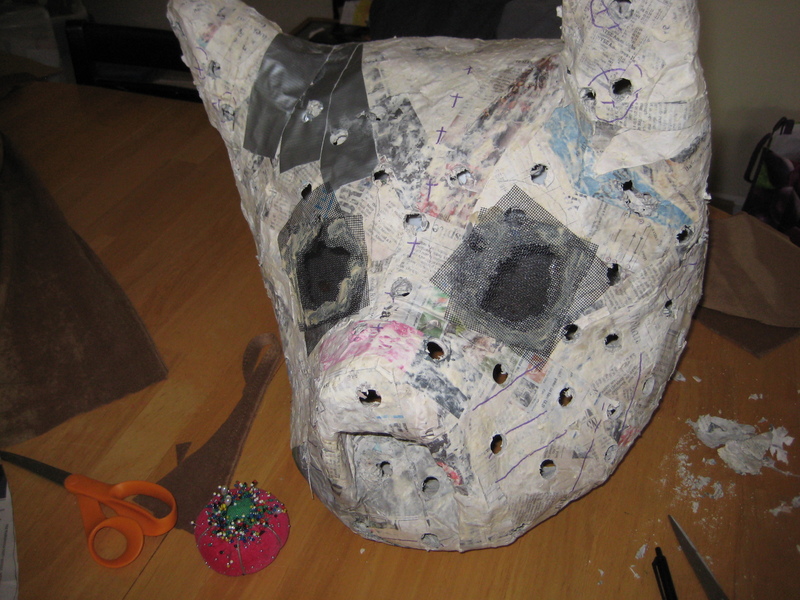 With the mask dried, I drilled holes for increased ventilation (and to lower the weight) and covered the eyes with a double layer of screen. Now the hard part. 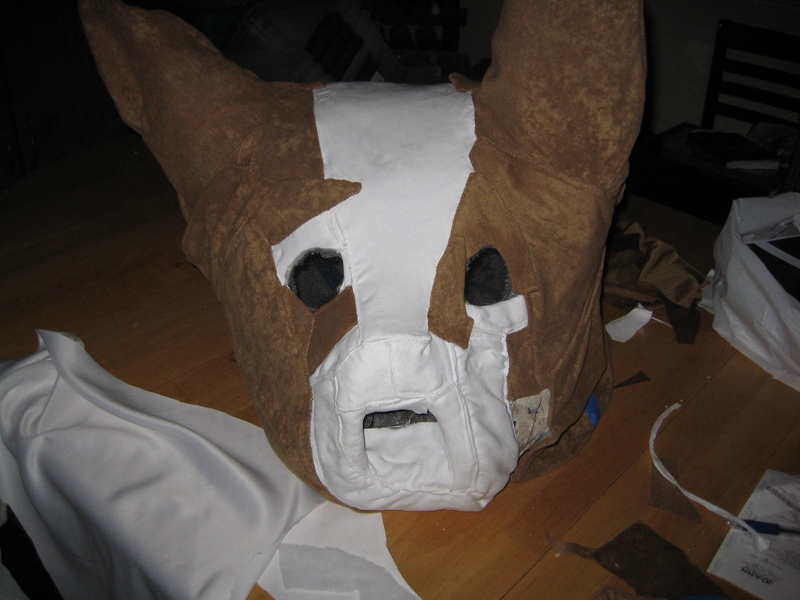 Because I am an English teacher, not a math major, I had to figure out how to sew different shapes of fabric over the mask to create the corgi look. 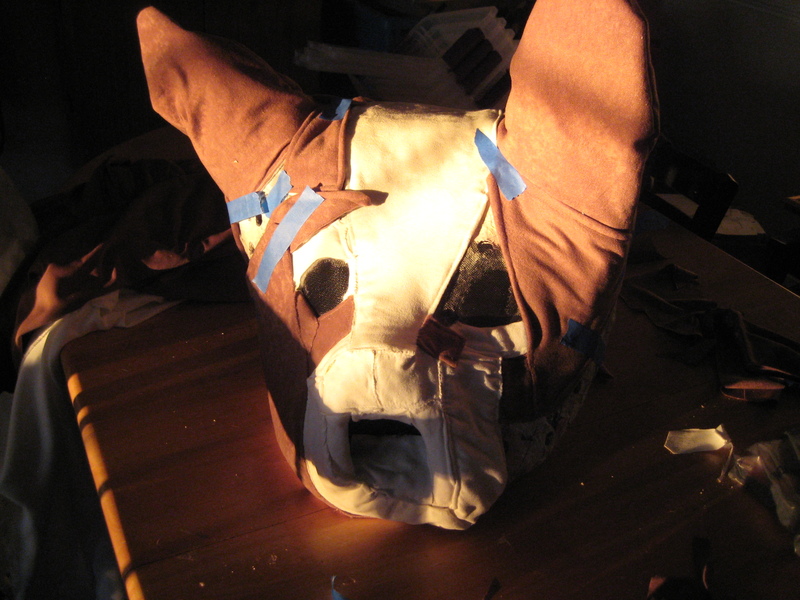 I used a bit of glue for security, then sewed the edges of all the pieces together. 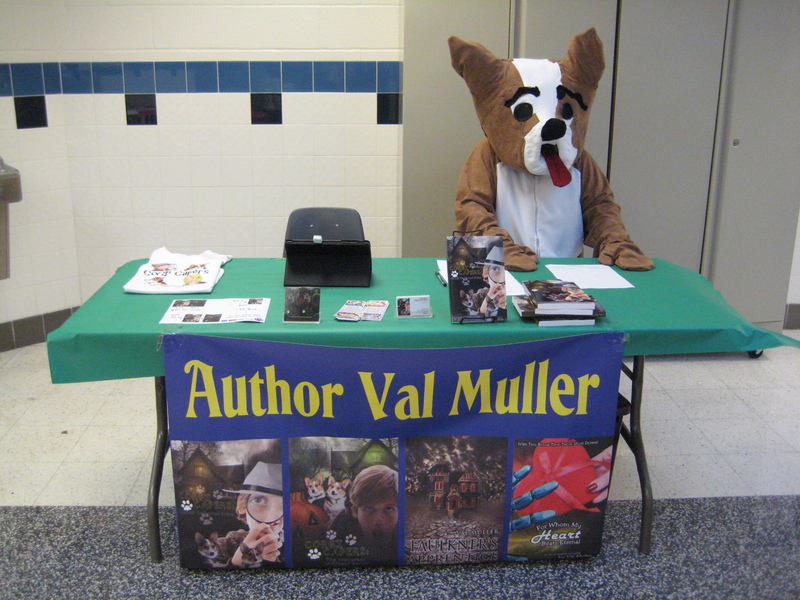 I added the red tongue and eyebrows just in time for Corgi the Corgi’s first book signing! 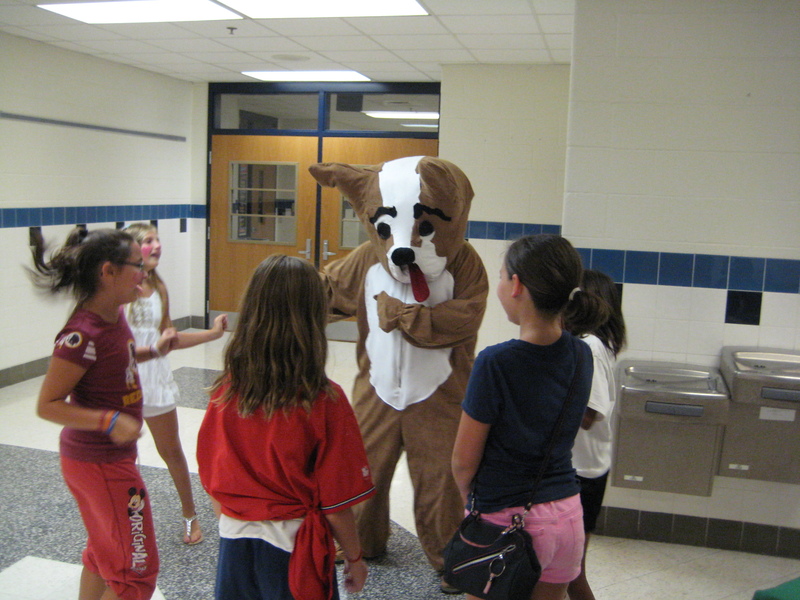 It turns out Corgi the Corgi is a pretty good dancer… and was the star of the evening! 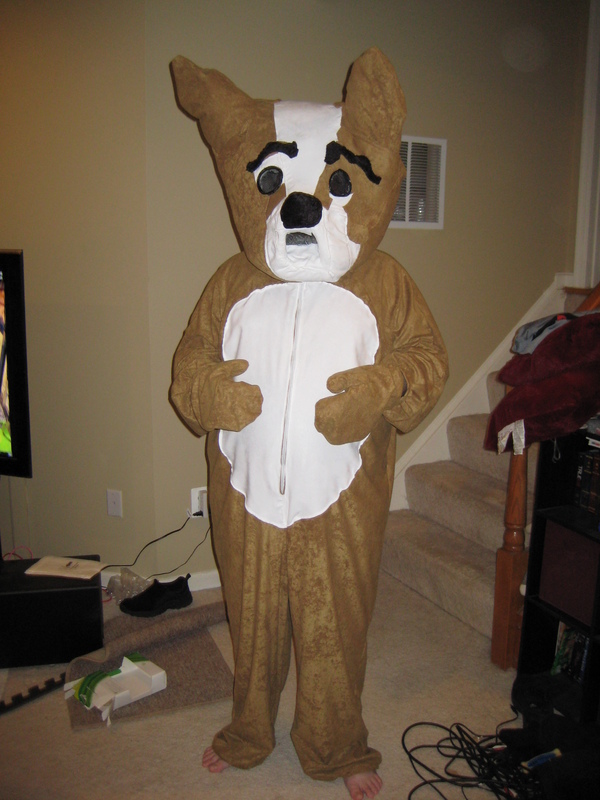 A special thanks to my husband for donning the costume all night. Hey, at least with all the dancing, he got in his exercise for the day! 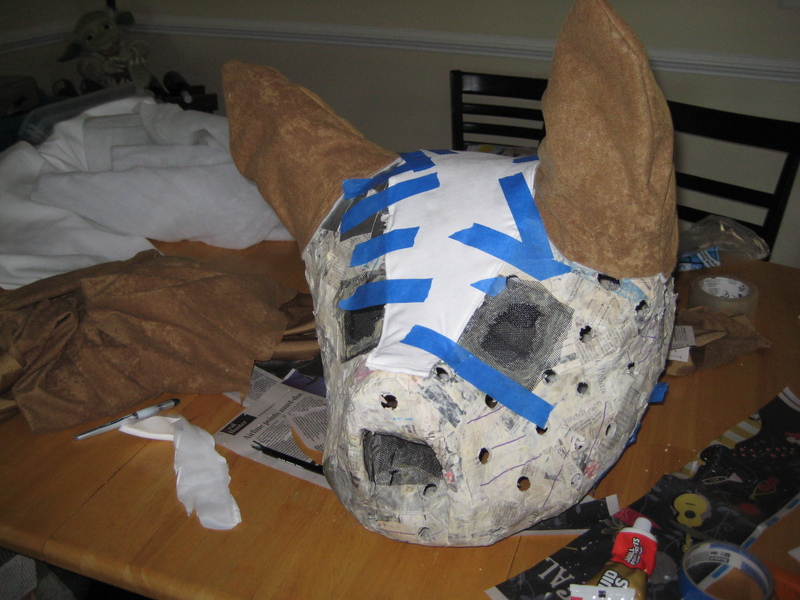 Stay tuned–Corgi Capers Book 2 is coming soon! 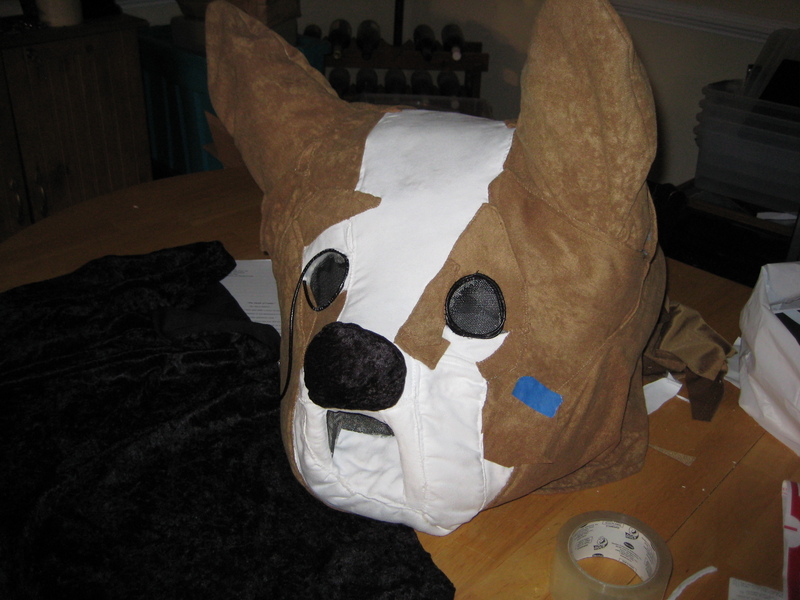 Posted on September 15, 2012, in character, corgi, corgi capers, photo. Bookmark the permalink. Leave a comment.